A dramatic lakeside setting invites cocktail sipping, but the food and service don't add up to dinner. 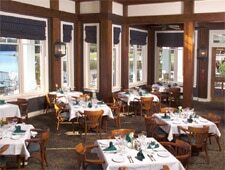 : Adjacent to the 36-hole Stone Mountain Golf Course sits a clubhouse open to the public. While it's a good spot for a pre-dinner cocktail and maybe an appetizer (the crab cake is nice) as you watch the paddlewheel boats ply the waters of the park's lake, any thoughts of dinner should take you elsewhere. Badly in need of fresh paint plus a waitstaff that hasn't a clue about service, this restaurant charges serious prices ($20s for most main courses) yet delivers a wine list that has little to offer, especially by the glass. Stick to simple fare, such as prime rib. Entrance to Stone Mountain Park is $8 per vehicle unless you have an annual pass, which costs $35. Enjoy the park, but bring a picnic.